This is how the fibers tend to arrive, in a large mass all tangled together, at this point you can use them for anything, making paper, doll hair, very organic flowers, emellishment in a landscape piece, etc. Throwster's waste contains sericin, this sericin acts like an adhesive when spritz with water and heated with an iron, when heated the sericin causes the silk fibers to stick to themselves thus creating a sheet of silk paper or constructed cloth. 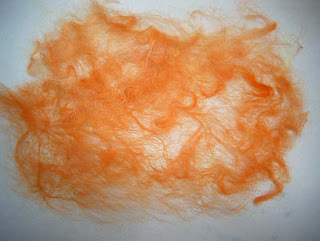 To make silk paper with throwster's waste pull the fibers apart to form a thin single layer. 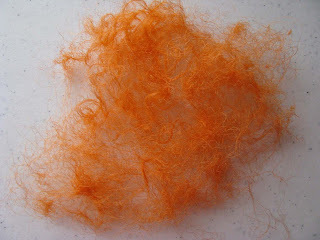 Spritz with water, but don't drown the fibers. 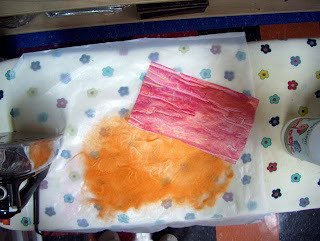 Using either two pressing sheets or parchment paper - I use deli sheets - place your layer of fiber in between the two sheets and press with a hot iron. You don't want to scorch the fibers so keep checking on the papers progress by lifting your top pressing sheet and see if they have bonded. 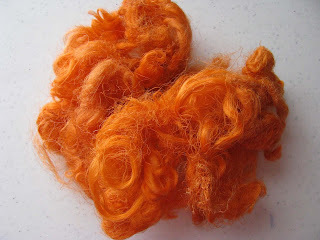 Once they have bonded you can then add a second layer of throwster's waste and heat set to bond both layers for a thicker layer of paper or leave as is and use for embellishment, needlefelting, etc. 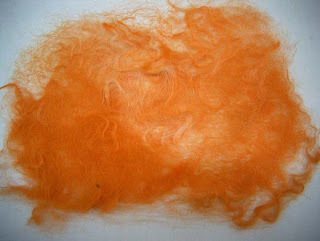 The fibers need to be teased apart, if you iron them together in this stage, without teasing them, you will end up with an unworkable mass. Pull the fibers apart gently silk, they don't need to be completely pulled apart, just seperated a bit to make a single layer of fibers. 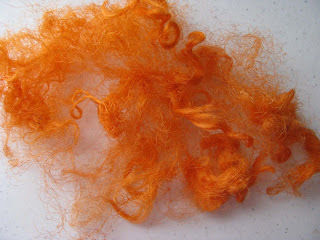 Tease the fibers apart further until they are thin and gossamer like, if you wish to have thick areas this is fine, these areas might need additional pressing and water in order to form a bond. Second layer of throwster's wasted ironed to the first layer, it's important to spritz the first layer with water so that the second layer will bond with the first layer. 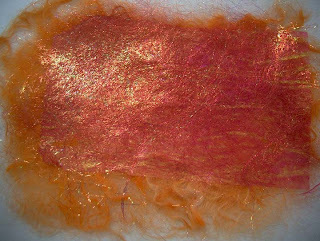 Painted Bondaweb that will be ironed to the silk throwster's waste paper, I used a fabric paint with a metallic sheen called Pink Halo. I cut the painted bondaweb to size and then pressed it to the throwster's paper, I used two pressing sheets, one above my paper and one below, to sandwich the whole thing to prevent the bondaweb from attaching the iron and ironing board. 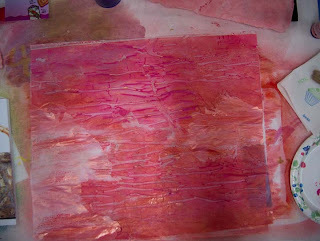 Here is the silk paper with the painted bondaweb attached, the paper is strong enough on it's own to be used for embellishing, but I chose to add the bondaweb as I was wishing to make some flowers for collage that had a bit more bling. Detail shots show that you can still see the fibers underneath.